The official unveiling date for the upcoming Oppo R9 and R9 Plus is March 17, something that has been confirmed earlier today after initially being reported on last week. Most of the hardware details of the two devices are already known thanks to the fact that they've passed through TENAA, the Chinese regulatory authority that approves mobile phones for sale in that country (and outs most of their specs in the process). One thing that's so far remained a mystery, however, is how much they will cost. Not anymore, though, for a newly discovered leak out of China is here to clear that up too. The image you can see above is said to depict a promotional poster for the R9 and R9 Plus, and if it is the real deal it reveals the pricing for the two models, at least for the Chinese market. 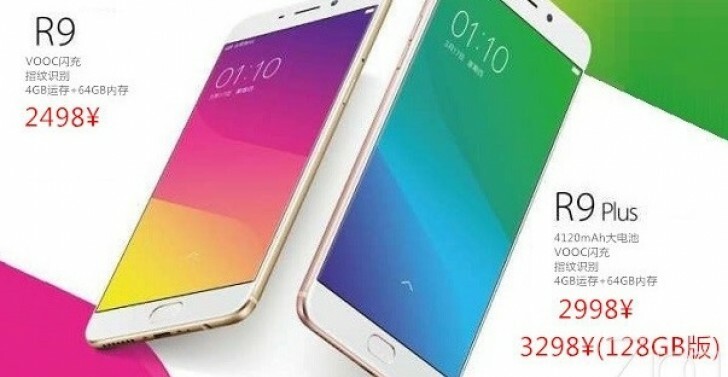 The smaller Oppo R9 will go for CNY 2,498, which at the current exchange rates means about $383 or €347. On the other hand, the R9 Plus will start at CNY 2,998 ($460 or €417) if you buy it with 64GB of storage, and will go up to CNY 3,298 ($505, €459) if you need 128GB. Both phones will come with 4GB of RAM, and it looks like the R9 will only be sold with 64GB of storage space. They will have VOOC fast charging, and the much-rumored 4,120 mAh battery capacity for the R9 Plus is confirmed yet again.